Managing agency datasets are integrated into PAD-US for federal agencies, some national nonprofits, and as available for each state. Appropriately, the USGS PAD-US team uses the names as submitted by the contributing data stewards. 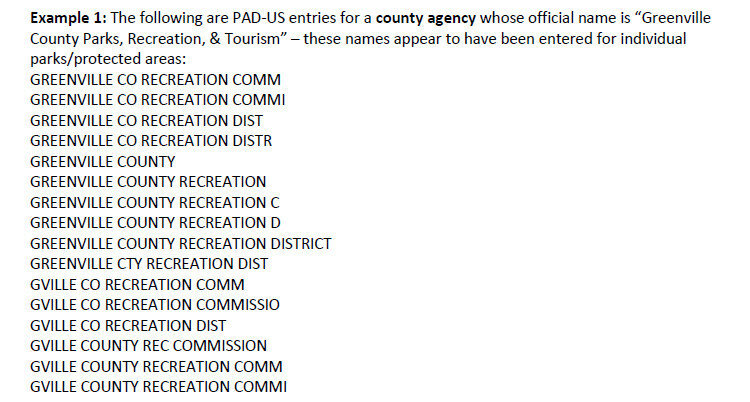 GreenInfo Network’s involvement in developing the California Protected Areas Database (CPAD), which has 1,000 agencies’ holdings inventoried, and its longstanding work with PAD-US led us to develop a short working paper about agency naming practices, which you can download here. In it, we review the issues with naming, as discovered in reviewing PAD-US data from states, and we outline ways that state data stewards can easily improve their inventories of local and regional (and even state) holdings. While it may take a few hours (usually not more), once done, it makes a dataset much more valuable to users. Lots of GIS options are reviewed. The paper also outlines a way to have a simple master agency database (usually in the form of an online spreadsheet), which, linked to a GIS database through an agency ID, can make both updating much more efficient and can add more functionality. In California, for example, we take standard agency levels or types (“nonprofit, special district”) that are assigned to every agency and create subtypes (“land trust”, “museum”; or “port district”, “flood district”), allowing for much more specific queries and searches. Changes done in the agency database are then rolled automatically into the GIS database via linking (all of which can be done fully in GIS, too – but the above approach may be more straightforward for small agency GIS shops). Give the paper a read and let us know what you think! ProtectedLands.net is a project of GreenInfo Network, a nonprofit technology support organization. This web site is a supplement to the USGS PAD-US web site, not an official USGS web site. © 2019 GreenInfo Network. All rights reserved.